Unlike so many condos for people, I am hoping my just completed condo project for orchard mason bees will soon be abuzz with activity. I’ve been meaning to build one of these since I read an article in Fine Gardening about raising raspberries and the importance of orchard mason bees as pollinators. Leaf cutter bees are inhabiting the condo. Last fall, we had an article in Northern Gardener on the honeybee crisis. Honeybees, which are responsible for much of the pollination of commercial crops such as almonds, have been dying off in large numbers. Marla Spivak of the U of M is a bee expert, and she believes several factors may be causing the die-off, including mites or diseases and changes in habitat, such as prairies becoming residential areas and large monoculture crops (corn). If you are interested in honeybees or just want to see pictures of people with bee-beards, please check out the U’s great Bee Lab web site. Once you have the wood, you drill holes 5/16th of an inch in diameter about 3 inches into the wood. Drill as many holes as you want, but there should be about 3/4 of an inch center to center between the holes. I got 28 on my block. Then, attach the roof to the block, and the block to the mounting piece and you are ready to hang your bee house. The bees like it facing south, so I mounted mine on one of the posts of my pergola. The bees use the holes in the house for nesting. They love pollen from apples and raspberries and I have both very close to the bee house. With any luck, the bees will help produce a good crop of raspberries, apples, veggies, flowers, and more bees this summer. Wow, thanks for the instructions. Thanks for getting the word out. 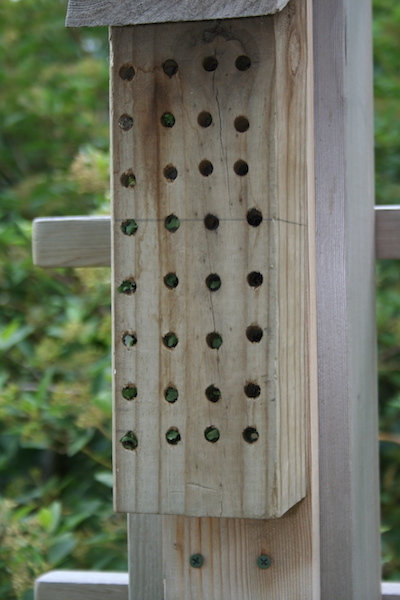 I just blogged about building a bee condo. I hope people try it. It’s lots of fun! It’s important that your block of wood is actually DEEPER than 4″ (thus a 4×4 won’t work) because you’ll only raise male bees in the shallower sections of a bee block. The females require holes in excess of 4″ !! Thanks for the comment, Steve. I did not know the female bees required more depth.